Congratulations to George, can't wait to see the pics! I think somebody won with a 1912 touring two or three years ago. I love the color! It looks great! Do you know what color and paint he used Bob? That is one awesome car. Welcome to the Stynoski club George! I'm glad to see he painted it the right color and striped the hood correctly. 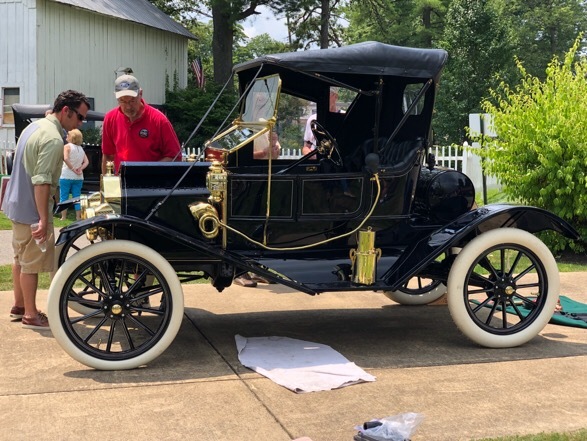 Congratulations to George Schreppler on a fantastic restoration. I am looking forward to more information about the year of the car. As Keith shared, it looks like the typical 1911 model year style. But was it produced far enough into the 1912 model year with the older body, that it is considered a 1912 or is there some other reason for the 1912 date? I look forward to seeing additional details about the car. I love to learn from the Stynoski Winners, as they are very accurate examples -- not perfect -- but very accurate of how the car could have come from the factory. And thank you Bob for posting the information. Fellows, I hope I stated the year correctly, sorry if I didn't. George is on the forum regularly, so I'll let him fill in any missing details. Hap, The car is a open valve 1911 Torpedo. There will be more photos on component's when he does his article in the Model T times. George did a lot of research when he was restoring the car. '11 Torpedo is my favorite Model T.
Congrats from the 1995 and 2007 winners! I�m just getting ready to paint an 11 Torpedo chassis. Could someone tell me about the correct chassis color? I have seen black and blue on seemingly original cars. What is accepted as correct? Thanks Mark and Phil Eyre and congratulations again! Wish I could have seen it in person! George, it's been a long time coming and an absolute ton of work! Congratulations! I'm thrilled for you! Someday I'd like to drive a Torpedo. I'm 6'3" and I'm sure I'd fit right in. That car is stunning! I look at things differently than the Stynoski crowd. I like to restore them to mint condition too, but I also like to drive them. I also step on running boards, because that's what they are for. After a few tours, my cars always acquire a few scratches and chips in the paint, but hey that's what it's all about? They still look good when cleaned up. I know of several in the "Stynoski Crowd" who drove their car the entire tour - every mile - rain and shine. I think it's unfair of you to suggest that group of people are somehow less than you and your way of thinking. How many cars have you entered into Stynoski competition? One Beautiful 1911 Torpedo Roadster. You have got to love the fender and body lines of that year and wonder why that model changed so much in 1912. All of the Stynoski cars I have restored are very reliable and I have driven everyone of them some more than others. Eric who posted earlier drove his car on tour in maybe the worst week of weather ever endured on a MTFCI tour. We spent about two weeks cleaning it afterwards. Not sure of chassis color on my 11 touring but the build sheet says color is "Blue". But I can tell you that my car is black. Paint is original. Wasn't there a red 1911 Torpedo and a 1912 Torpedo with period front brakes on the Redwood Trees Tour? Gorgeous car -- well done. Can't wait to see the write-up. You're pretty observant to notice those brakes on the front of that '12 Torpedo. It looked like they were copied from either the Big Four or the McNearny front brakes made back in the 20's for the Model T's. Ya, there were a few Torpedos Roadsters there on that tour. I saw a couple of them out on the road moving along at a good clip. Several years ago, I had the pleasure of driving Mark Cameron�s �11 Torpedo. It was by far, the most comfortable cockpit of any Model T that I�ve driven, before or since. I�m 6�4� and broad of shoulder and belly. Thank you for clarifying that it is an open valve 1911 car. It is beautiful and I will be looking forward to the article and photos in the Model T Times. I have also had the privilege of driving a 1911 Open Runabout (basically the same as a Torpedo but without doors) for some distance. I too found it to be a very comfortable car to drive. Personally I see no reason for show cars and driver quality cars to be mutually exclusive. Often it takes a bit more work but it's doable. The 26 Touring I own and Gordon's 26 Runabout were both driven extensively before they won Stynoski and both cars were subsequently driven a lot between Stynoski and their AACA Senior Grand National awards. I know that's harder to do with a brass car but not impossible. Larry, I feel the same way as you. I was awarded a AACA first at Hershey in 1996 and the Stynoski in Vermont in 2012. I have never stopped driving it. A model of a 1910 Torpedo drew me to the Model T when I was six. They are beautiful ! Congratulations to all Stynowski winners past and present, and thank you for your efforts to preserve authentic cars !! Even better they are solid drivers. I had the privilege and honor to judge this beautiful Torpedo at the MTFCI Annual Tour, and I must tell you, George did a wonderful job with the car's restoration. The car is very correct and runs beautifully. George conducted extensive research and found numerous original photos to document his car's authenticity. Great Job, George!!! 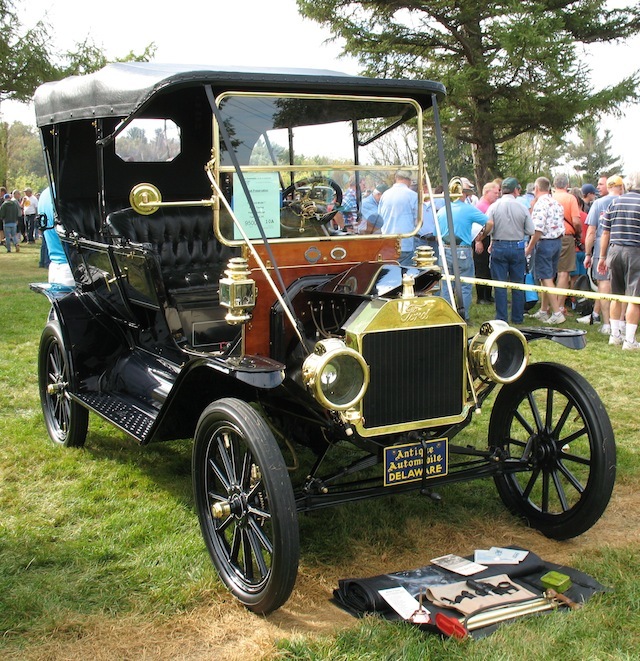 Regarding Larry's comment about driving "show cars": When my 1913 Touring was awarded the Stynoski Trophy in 2010, I drove the car throughout the tour following the show. We drove in rainstorms, on dirt roads and had a wonderful time on the South Dakota tour. I know you can have a show car and still drive the "dickens" out of the car and have loads of fun. Russ,George Drove his car on the tour later in the week. I was following him. I could not keep up. I told him to go on. I knew the fellow ( Bob Prouse ) that owned it before him.It was a very powerful car. As far as your comment to Larry's about driving show cars. 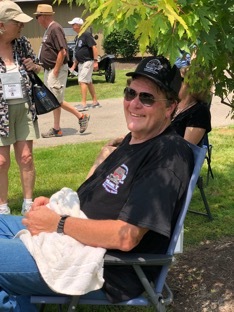 At the banquet, Don Lang came to the table that Mary and I were sitting,He shook my hand and told me that he can't get over how we can keep our car in show condition and still drive. I can't tell you how much that meant to me. Having seen Pete's car at Hershey, I can testify that indeed it is possible to keep a car gorgeous and still drive it.